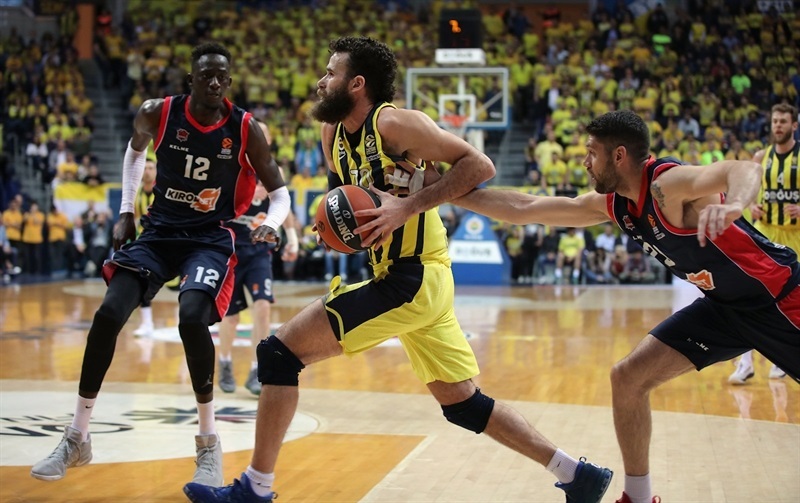 Fenerbahce Dogus Istanbul, the reigning Turkish Airlines EuroLeague champion, made a first step towards a return to the Final Four by holding off visiting KIROLBET Baskonia Vitoria Gasteiz 82-73 in Game 1 of their playoffs series on Wednesday. 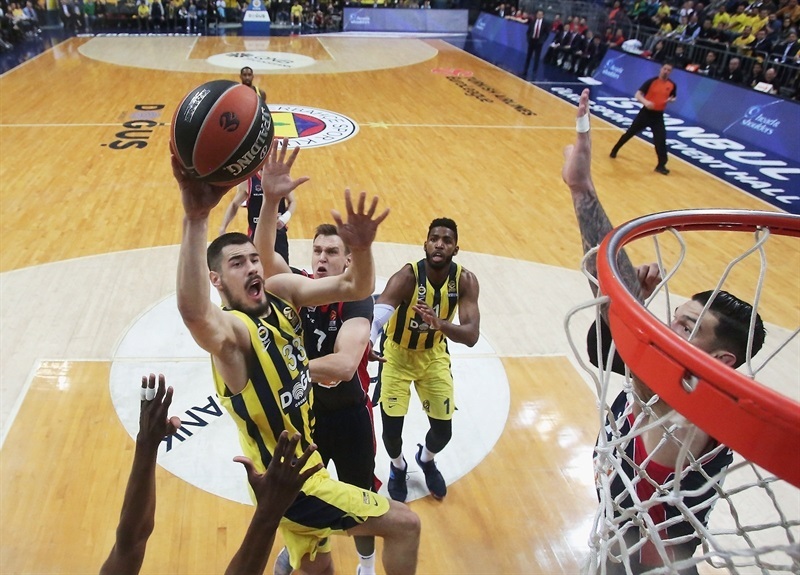 Fenerbahce used a strong first half, relying on its suffocating defense to build a 20-point lead, then fended of Baskonia's attempt to rally in the second half. 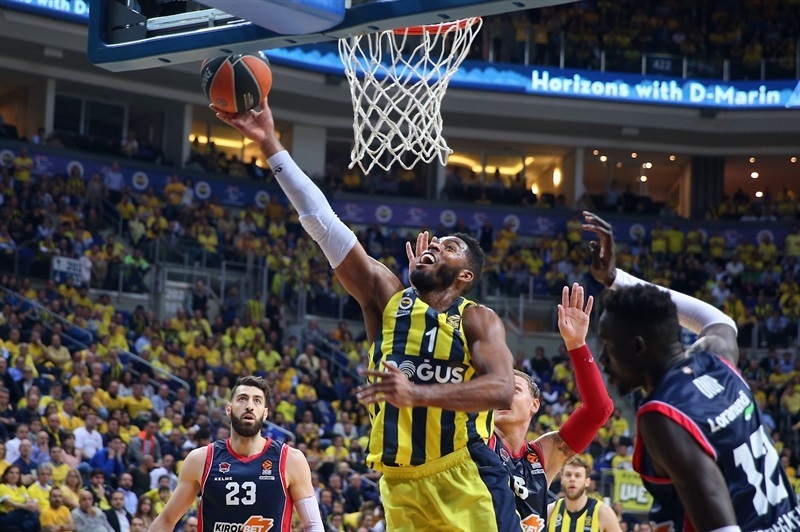 Brad Wanamaker finished as Fenerbahce's top scorer with 16 points, while Kostas Sloukas had 10 points and dished a career-high 11 assists. 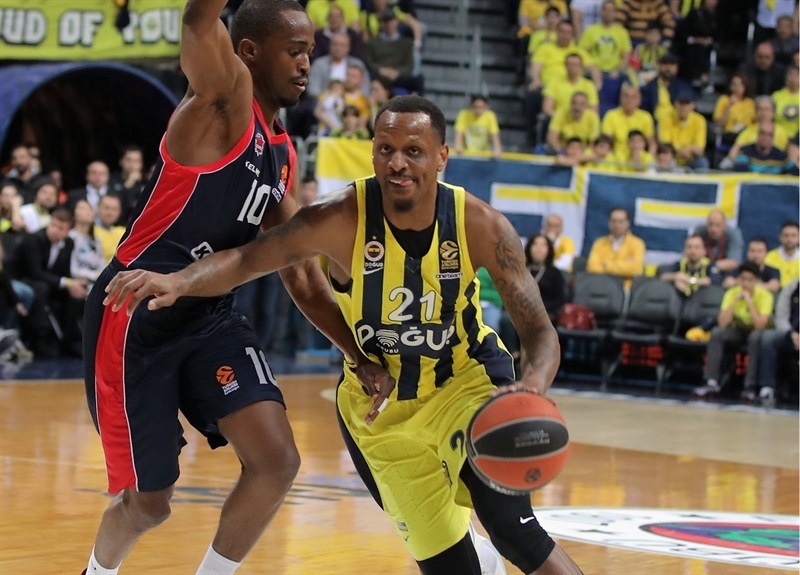 Jan Vesely had 13 points and 7 rebounds, while James Nunnally also scored 13 in victory. 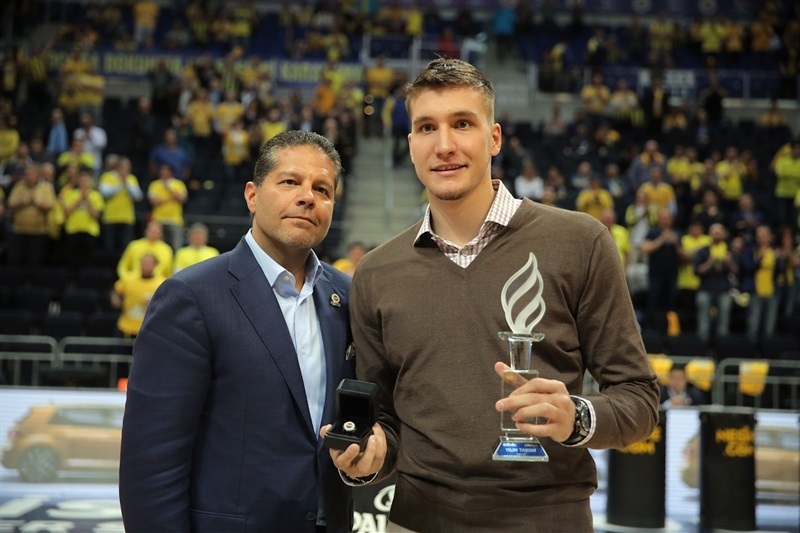 Tornike Shengelia was the visitors’ top scorer with 16 points. Rodrigue Beaubois scored 13 points, Luca Vildoza 12, and Matt Janning 11 in the losing effort. 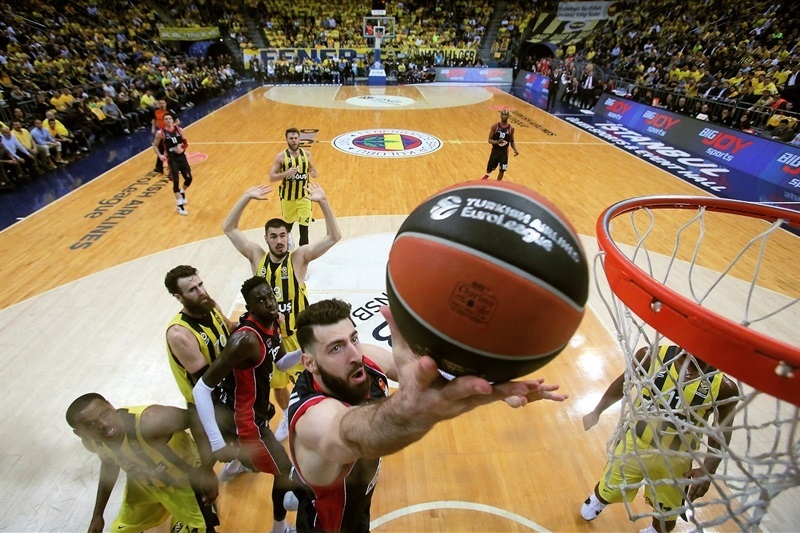 It was the 10th playoffs win in a row for Fenerbahce. 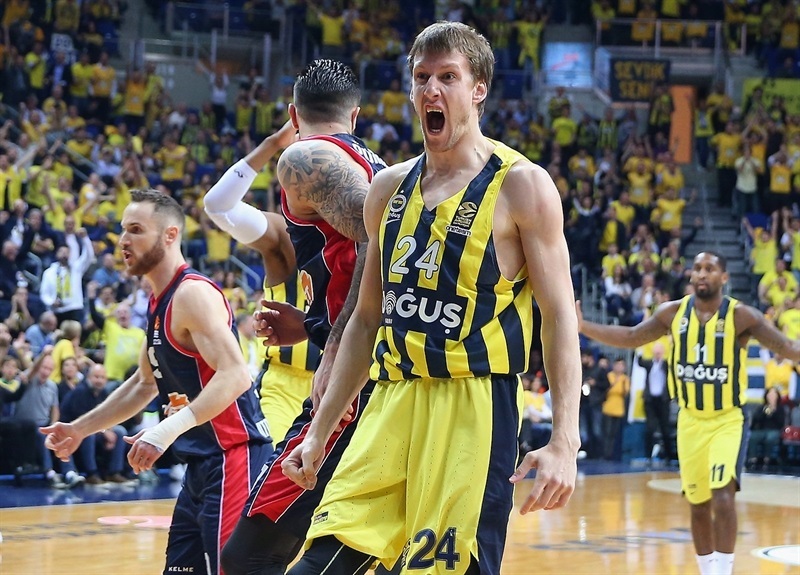 Fenerbahce quickly took control as Vesely had a monster dunk and Nunnally drained a triple. 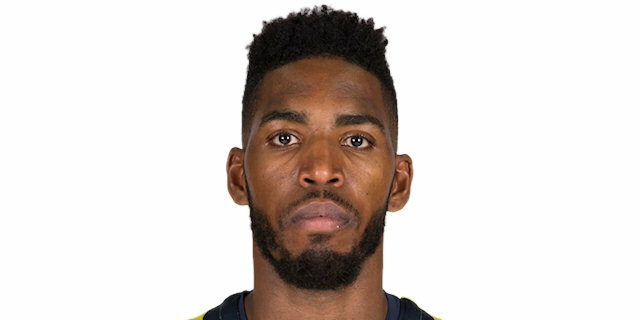 After Beaubois got a steal and a dunk for Baskonia, Fenerbahce pulled away by 12-4 with Wanamaker adding a triple to a jumper before Jason Thompson fired in a long two-pointer. 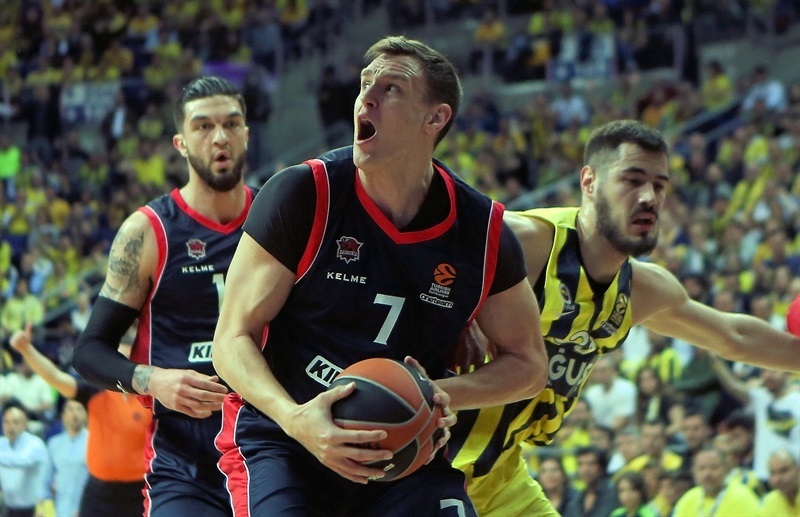 After a timeout, Baskonia's Shengelia hit from close and Janis Timma from long range to cut the difference to 13-9, but Fenerbahce replied with a long jumper from Nunnally, and close-range baskets from Thompson, Vesely and Luigi Datome to open up a 21-11 after 10 minutes. A dunk and a hook shot from Ahmet Duverioglu extended the lead to 25-11 early in the second quarter. 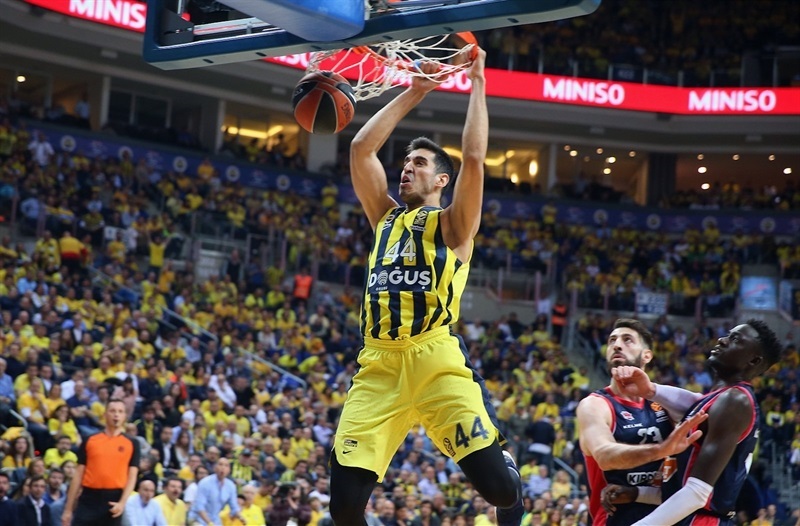 Shengelia had a three-point play for the visitors, before Kostas Sloukas and Janning traded triples. 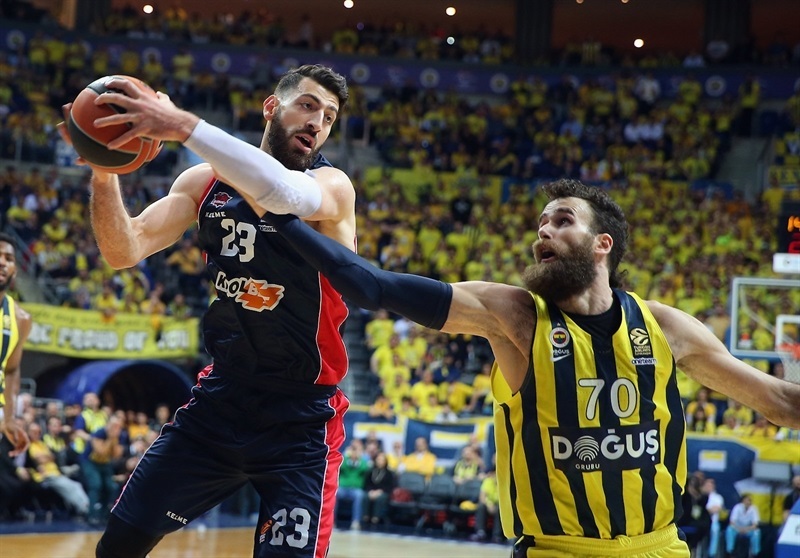 Baskonia cut the deficit to single digits, but only briefly, as back-to-back threes from Nicolo Melli and Datome against the visitors' full-court pressure meant a 34-19 margin for Fenerbahce midway through the second quarter. 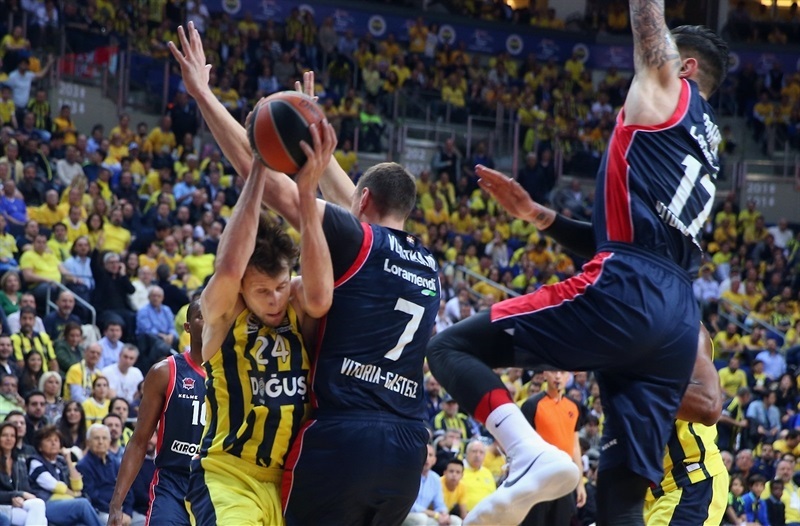 Janning and Beaubois drove for layups, forcing a Fenerbahce timeout, but what followed was a 9-0 run, sparked by back-to-back Sloukas-to-Vesely alley-oops, and capped by a Marko Guduric triple at 43-23. Baskonia was held without a single point for almost 5 minutes before Luca Vildoza closed the second quarter with a layup-plus-free throw, making it 43-26 at halftime. 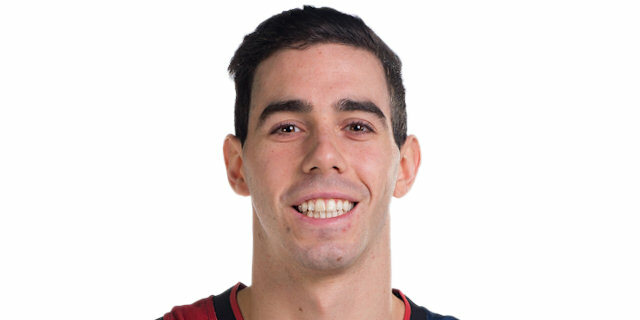 Baskonia got into a better offensive rhythm in the third quarter, with Vildoza scoring a pair of close-range baskets, and Vincent Poirier netting a baseline jumper, but Nunnally had a long jumper and a four-point-play that extended the lead to 51-32. Ilimane Diop and Vildoza scored for Baskonia before Janning knocked down back-to-back triples. Sloukas drove for a pair layups, including a basket-plus-foul, before Marcelinho Huertas hit from downtown to lower the difference to 60-50. 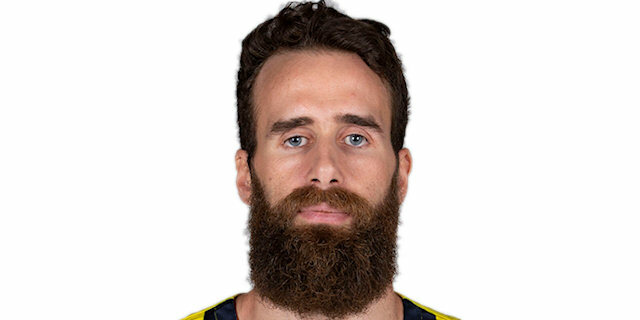 Datome had a three-pointer at the other end and Marko Guduric hit an off-balance runner to give Fenerbahce 65-52 at the end of the third, but Huertas and Beaubois quickly cut the deficit to single digits early in the fourth, making it 65-58. 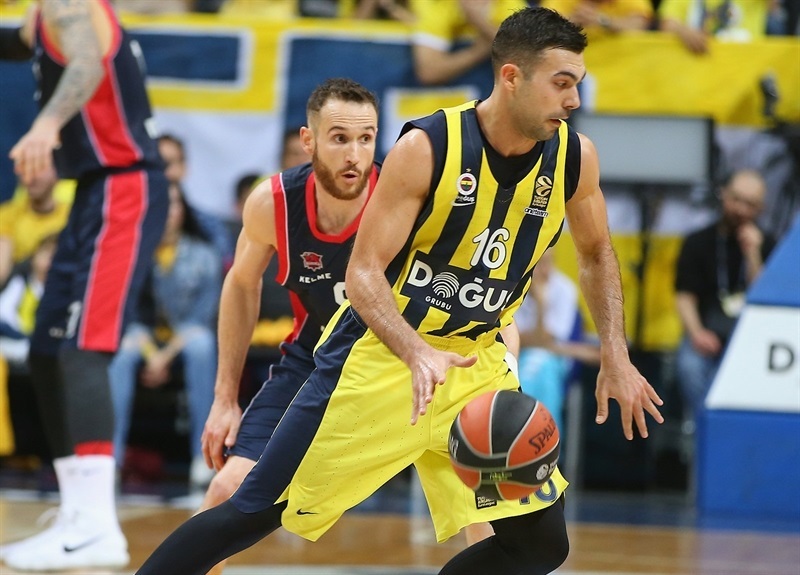 Fenerbahce stepped up defensively then to stop the visitors' momentum while Vesely and Wanamaker went perfect 6 of 6 from the free throw line to restore a double-digit margin. 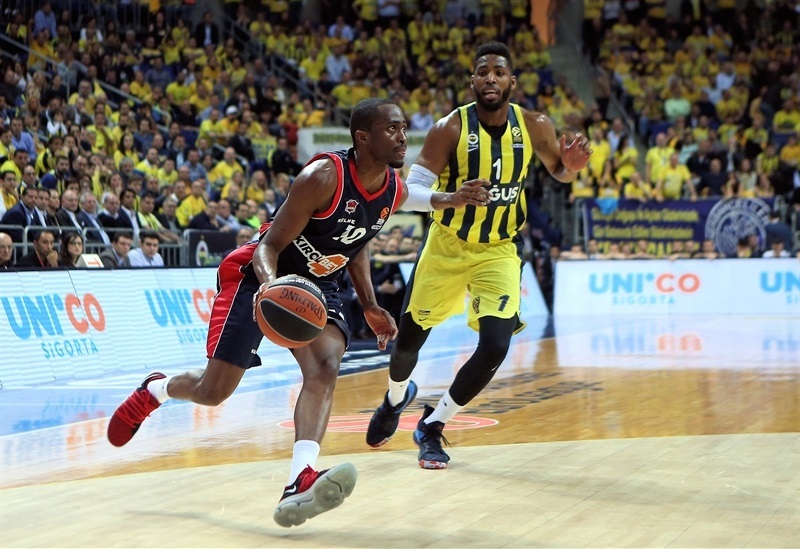 But Beaubois had a three-point play and Shengelia drove coast-to-coast to make it 71-63 halfway through the fourth quarter, keeping Baskonia's hopes alive. Wanamaker knocked down a three-pointer for the hosts, but Vildoza answered right back in the same manner. Shengelia added a three-point play to make it 77-69 with 1:40 to go, but Wanamaker sealed the deal on the ensuing possession with a corner triple as the champs protected their home court again. "We were prepared to play against a team that plays aggressive basketball defensively, always trying to run and score in transition. And we really played really good in the first half. The problem was offensive rebounds. Baskonia had 12 in the first half. Except that part, everything was very good for us. At halftime we talked about how Baskonia never gives up and will try to come back, and that's what happened. They continued to play aggressive, and we had to continue to be ready for that. The series just started. The results is not important. One or 11 or 21 points, it is all the same. It is only important that it is 1-0 for us. Congratulations to my players for the win. The atmosphere in the gym was excellent. Fans always help the team, and I am sure they will help us again on Friday." "We tried to play the best defense possible. That is how we prepare the game. Against Baskonia, it is very important to try to stop what is the best in their game, because they have a lot of things they do good. It is the transition that I talked about, their big guys are able to run the court. They push the ball always, they have shooters able to stop in transition and shoot. They also have a lot of set plays for their shooters, and an inside game, especially with Shengelia. All these things are important, and you have to be ready for it during the game." "It was a tough game for us. We did not start in the right direction. 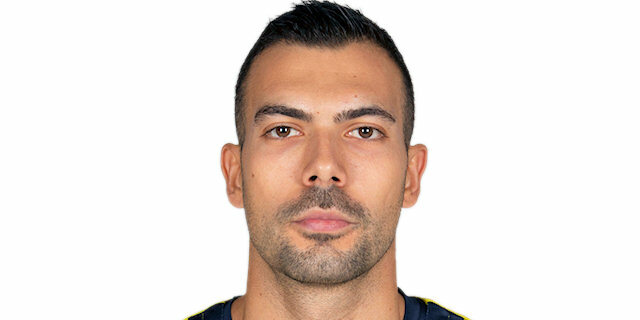 The intensity of Fenerbahce was much better. I am proud of my players in the second half. 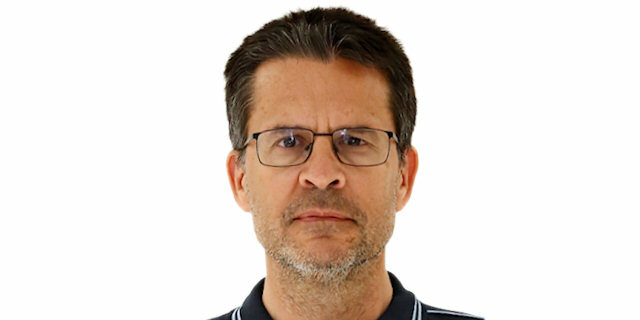 The situation was very bad for us, but I think that all my players fought and now we have to see what we can improve for the next game and be ready in 48 hours. 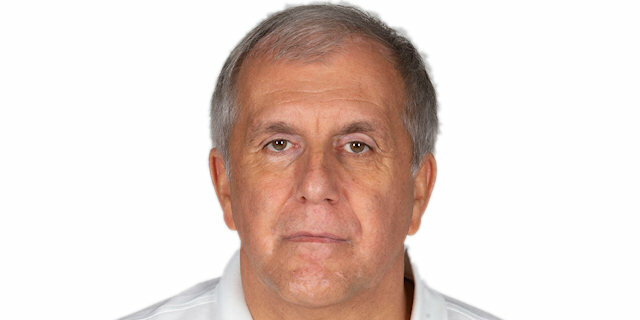 We enjoyed the atmosphere, and congratulations to Fenerbahce." "It feels good, but we won only one game. Yes, it's a critical match, but the second game will be even more important. We played well in the first half and we expected Baskonia to come back in the second half. But I think we stayed calm. Our supporters were great. The second game may be different but we have to react. We have to forget this game immediately. We will have a chance to go up 2-0, but we will have to try to play smart." "We needed and had a strong start. We did good on both the offensive and defensive sides, but we had our mistakes from time to time. We have strong players inside and we need to concentrate better on both ends of the floor in the next game. We have won the first game and we have to play the second game with the same confidence." "In the second half we showed who we are and that we can win here. We know that it's going to be tough to beat the defending champion on their court, but everything is possible fighting for every ball. Our attitude will not change."